My Three Wise Color Monkeys painting has progressed this week. If you want to follow along but this is the first post you've seen, you may like to go back and read Part 1 and Part 2 for the previous stages. It'll give you a good insight into how I create my paintings that you may wish to try yourself. 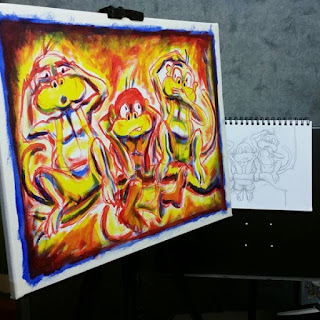 After drawing the initial image onto the canvas in red acrylic paint, and using the same color to block in mid tones, I continued on with my under painting. 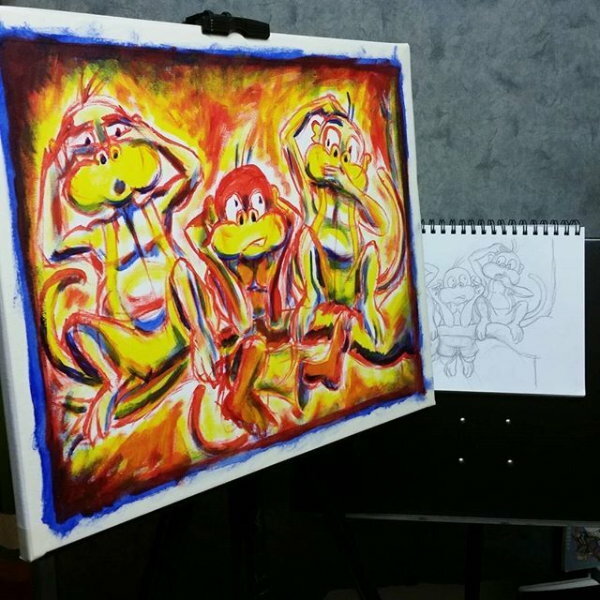 The under painting consists of the three primary colors filling areas of shadow (blue), mid tones (red), and near highlights that aren't white (yellow). I work very rough, as you can see from the image above. I've used this same technique for my under painting since about 1995, when I used to work primarily in soft chalk pastels. An acrylic under painting gave my pastels are more 'painterly' look as the brush marks and color would still be visible under the chalk. When I switched from chalks to working entirely in acrylic I continued starting with this under painting because it still helps to make my work look more 'painterly' by showing through the layers. Also, it helps to get a painting started, and looks like you've progressed quite a bit, really quickly. Typically this stage is completed in under 30 minutes on a painting this size. Applying the base colors consists of blocking in the background to how it will look in the completed painting. Then blocking in the base color on the actual subject of the painting. At this stage I've finished the background and blocked in the color of the blue monkey - as I had blue left over from the background. (See image). 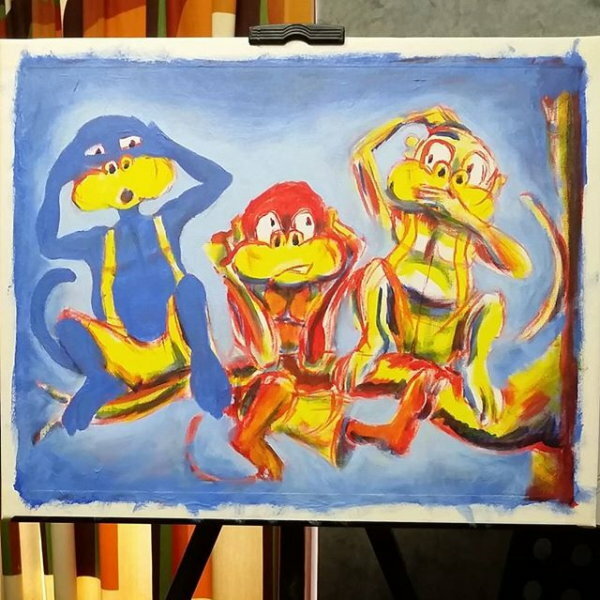 You'll notice that the background is pretty much just a gradient light to darker blue that gives a kind of 'glow' around the monkeys. It's a technique I've used on so many of my paintings because I really don't like painting backgrounds. My paintings are all about the characters. If I paint any background or scene elements at all it's usually only what's minimally required to support the characters. In this case, the only background element is the tree branch the monkeys are sitting on. I'm hoping to have all the base coloring done by this time next week, and maybe I'll even have started working on shading and other details too. If you'd like to follow this artwork's creation and want to see my work in progress photos sooner, my Instagram account is where you'll see them first. Be sure to stop by there and follow me for the latest images.